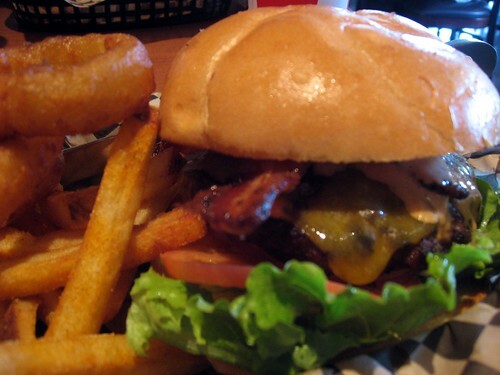 Recently we got a tip via Twitter about the Blazing Onion Burger Company. After a reading of their website, we knew we had to check it out. 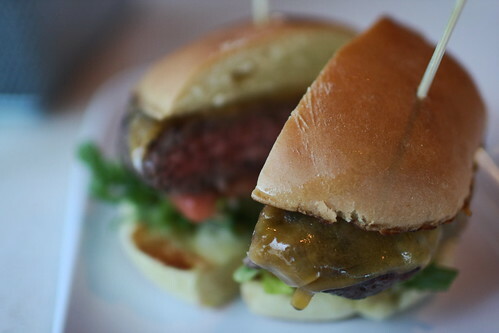 Promising to deliver a gourmet burger made with top-notch beef from Painted Hills, Tillamook cheese, and even locally made buns had me hoping for greatness. I made the trip to the Mill Creek location and ordered my standard medium-rare bacon cheeseburger. When my burger arrived it looked very promising. The bacon was thick and appealing, the cheese was nicely melted, and my bun was toasted. Unfortunately the taste didn’t live up to that first impression. Instead of the medium-rare patty I was expecting, I got one that had been cooked to death – apparently the standard medium-well that you’re given if you don’t specify as I had. Since they’re using good beef – Painted Hills is top-notch – why cook it to the point that you can’t tell what you’re eating? The bacon was chewy with good flavor. The cheese was solid. The house sauce had nice flavor, but was too runny. The tomatoes and red onion were both good, but sliced much too thin. In the case of the red onion it was so thin that it brought almost no flavor to the burger. The lettuce was good, but there was too much of it and it overwhelmed the burger somewhat. The bun was really good – it was nicely toasted, and was strong enough to hold up to the end without getting too mushy. The fries and the onion rings were really underwhelming. Clearly fresh from a freezer, they were thoroughly meh. + You can’t make great food without great ingredients and all the right makings are present. Two thumbs up for the local focus. – The overcooked patty destroyed the potential for greatness, and paying so much attention to the main ingredients while ignoring the sides seems odd. Herfy’s is a small gourmet burger shop in Redmond that offer a variety of differently themed burgers and sandwiches. There’s enough variety to justify a couple more trips if they’re able to nail the standard bacon double cheeseburger. Logically, if they have a firm grasp on the foundation, then there may be some merit in the rest of that menu. A toasted bun! Holy crap. Such a simple step in the burger-making process, but so often neglected. It didn’t really save the bun from becoming saturated, however, it was a light toast with little to no browning or taste alteration. Come to think of it, there’s a possibility that it was just slightly stale instead of slightly toasted. I’ll give them the benefit of the doubt and say toasted. The Achilles heal of this burger is the beef. Not that the rest is invulnerable, quite the contrary, I conquered and consumed it all. The beef patties are thin, cooked to well-done with little bits of gristle detectable in a couple bites, a major no-no. 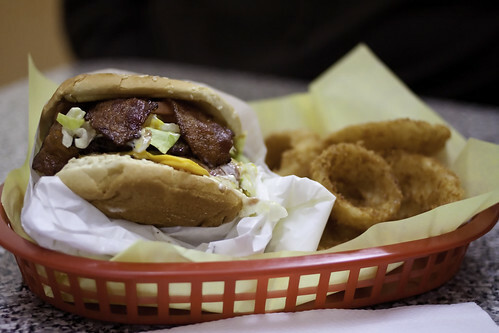 Where quality beef is the star of the burger, this is far from it, merely becoming a vessel for cheese, bacon and condiments. Taking part in diminishing the beef, the bacon was excellent and cooked to near perfection. The cheese was American, okay in my book, and melted to a gooey consistency between the patties. Complimenting that wonderful cheese was a mayo-based sauce, working in harmony with the burger. Lettuce, tomato were fine, but the pickles were too plentiful and bitter for my taste. Unbeef: Good fries, good onion rings, good jalopeno poppers, colon-destroying jalapeno burger (ie. “good”). + Toasted bun, great bacon, excellent cheese, solid burger sauce. – Over-cooked and low quality beef, pickle overload. Fatburger is about as close to fast food as we get, but there are a few key points which make it rateable for us. These burgers are cooked to order with what they claim to be the ‘100% pure lean beef and only the freshest ingredients’, and frankly, they were the only place open when I was out marauding for a burger late on a Friday night. Does their reputation for being a cut above the other Omega Replica fast food titans hold up to legit scrutiny? Let’s start with the beef. It tastes awful. It’s “seasoned” with salt and pepper, from what I could discern, but the ratio is off and it takes away from what I consider to be okay beef. Credit where it’s due: the beef was cooked to medium-well and had a good texture and sear on the outside. It just tasted bad, is all. The bun was mediocre, of course not toasted, and you’ll be glad they wrapped it with wax paper by the time you get to the end, as grease saturates the bun and becomes a condiment for your fries. The bacon was a little thin and fatty, but tasted alright. The cheddar cheese tasted more like American and the melt could use a little work. The lettuce was limp, bland, wet; it was everything that’s wrong with shredded lettuce. The rest of the veggies were bland and, over time, something about their combination became offensive. They throw some mayo and mustard on there as well. I didn’t care for that either but couldn’t tell if it was just tainted by the meat seasoning. This is the kind of food that cuts through you like Drano, however I do acknowledge that Fatburger has a place in the world of burgers. This is one of those burgers that could have been vastly different if I’d been around at a different time of day with a different cook and fresher ingredients during a high-traffic time of day, etc. But the burger before me fell short in so many ways. It’s a step above the big fast food guys, but don’t expect anything more than that or you will be bitterly disappointed. Unbeef: Open late! Fries taste like death. – Beef was seasoned to death. Veggies combine to form the sour megazord. Needs a real burger sauce.